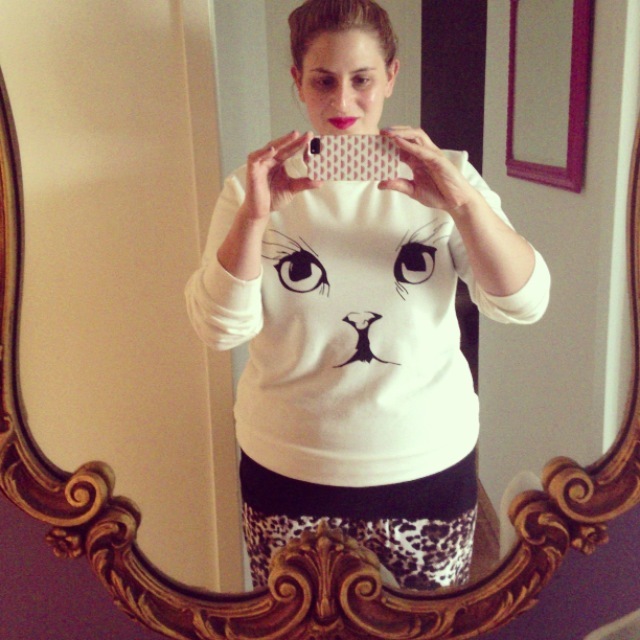 those of you who follow me on instagram may have caught a glimpse of my most favorite recent purchase: a cat sweatshirt from forever21. i haven’t shopped at “forevs” much in the past few years (in college, i could be spotted filling my arms with “going out shirts” at the retailer multiple times a week. oopsies, shopping addiction! ), but i happened to pop in after work on friday, and boy am i glad i did. apparently, sweatshirts are really in for fall. who knew! i’m a big fan of comfy clothes, so anytime something formerly schlumpy becomes acceptable and stylish, you can count me in. f21 had a variety of chic sweatshirts up for grabs, and most were between $17-22. can you say score? i picked up two: the cat print you see in the shot above (pardon my lack of makeup and by lazy bun), and this fun “team paris” option. i made it all the way to checkout with this one as well, whereupon i realized it was slightly ridiculous to spend $60 on sweatshirts, two of which were cat themed. #crazycatlady. you wouldn’t believe how much cat-themed stuff there was at f21. iphone cases. cosmetic bags. tshirts, crop tops, sweatshirts, skirts, blouses. cats are in, you guys. like, really in. to the point where both forever and zara are making knockoffs of the beloved charlotte olympia cat flats. it’s safe to say i’ve been waiting for this moment all of my life – the moment when it’s cool to be a cat lady. does this mean i can find a husband soon? want to get in on the kitty cat goodness? shop the looks below.